Jae Kyu Lee is the Professor Emeritus of Korea Advanced Institute of Science and Technology (KAIST). 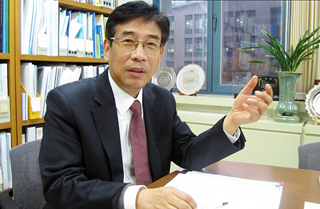 He has been professor of KAIST since 1985, and finished his tenure as HHI Chair Professor. He is newly appointed as Chair Professor and Director of Bright Internet Research Center at Yonsei University in Seoul starting from March 2017. He currently serves for the Immediate Past President and Fellow of Association for Information Systems, the global organization of 4,000 Information System researchers. He is the Founder and Director Emeritus of Bright Internet Research Center at KAIST. He is a chair of International Conference on Information Systems in 2017 that will be held in Seoul, and is the founding chair of the Bright Internet Global Summit that will be held in December 2017 for the first time. He has been a Professor of Management Information Systems and Electronic Commerce at KAIST since 1985, and is affiliated as a professor of Graduate School of Information and Media and Graduate School of Green Growth in the College of Business. He has served as the Founding Head of the Graduate School of Green Growth (2013-5), Dean of Energy, Environment, Water and Sustainability Initiative (2008-2014), Dean of the College of Business (2006-7), and Head of Department of Information System Engineering (1994-6) at KAIST. He was also appointed as Associate Dean of Faculty and Research, School of Information Systems at Singapore Management University (2005-6) as a tenured professor. He received a B.A. in Industrial Engineering from Seoul National University (1973), a M.S. in Industrial Engineering from the KAIST (1975) and a Ph.D. in Operations and Information Systems from the Wharton School, University of Pennsylvania (1985). He was a visiting professor of the Wharton School at the University of Pennsylvania (2000), University of Texas at Austin (1995), Carnegie-Mellon University (1989), and City University of Hong Kong (2001). He was the founding editor-in-chief of the journal, Electronic Commerce Research and Applications (Elsevier, SSCI and SCIE Accredited), and was the founding chair of the International Conference on Electronic Commerce. He was a chair of key international conferences such as International Conference on Electronic Commerce (ICEC 1998, and ICEC 2000), Pacific Asia Conference on Information Systems (2001, 2006), and the 3rd World Congress on Experts Systems (1996), as well as many other international conferences. He was the president of academic societies such as Korea Society of Management Information Systems and Korea Society of Intelligent Information Systems. He has served for the program committee of numerous international conferences in information systems and intelligent systems. He authored four English books and seven Korean books with many editions in the area of Electronic Commerce, Information System, and Intelligent Systems, including Electronic Commerce: A Managerial Perspective (2014 Springer; and 2012, 2010, 2008, 2006, 2004, 2002, 2000, Prentice Hall, co-authored with Efraim Turban), Artificial Intelligence in Finance and Investing (Irwin). He published many international journal papers in leading international journals such as MIS Quarterly, Information Systems Research, Decision Support Systems, Communications of ACM, Management Science, International Journal of Electronic Commerce, Expert System with Applications, European Journal of Information Systems, and many others. He presented many keynote speeches and proceeding papers in major international conferences and workshops such as ICIS, PACIS, AMCIS, and ICEC. He received best paper awards nine times from the major conferences such as the Hawaii International Conference on System Sciences (Internet and Digital Economy Track in 1997) and Korean national conferences of Management Information Systems, Intelligent Systems, and Management Science. He received the honorable award, Maekyung Economist Prize (2004), which is given to the best researcher in Economics and Management. He also received a national decoration from the Korea Government for his contribution to the development of the IT industry. KAIST has awarded him three times for Outstanding Academic Achievement (1998), International Academic Collaboration (2009), and Contribution for the Development of KAIST (1993). His current research interest is the development and deployment of Bright Internet technologies, policies and global collaborations. His research evolved from the application of Artificial Intelligence for Managerial Decision Support (various applications such as stock investment, scheduling systems for complex manufacturing industries, and intelligent system for electronic commerce) to Green IT (smart grid and green business). He has conducted 45 granted projects on the topics of the Bright Internet, Green Business, eCommerce strategies for financial sectors, SCM and eProcurement Systems, case based project management systems, intelligent scheduling systems for ship building, power generation, and refinery.